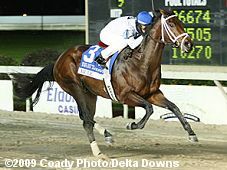 Note: He won the Jean Lafitte at Delta Downs in track record time, and then the Delta Jackpot (G3) over a sloppy track also at Delta. With $450,000 of graded earnings from the Jackpot he is ensured a spot in the Kentucky Derby field if entered. He then won the Sam F. Davis (G3) at Tampa Bay Downs on February 13 and then finished third in the Florida Derby (G1) on March 20. Trainer Todd Pletcher declared him out of the Derby on April 26 after unsatisfactory workouts over the Churchill surface. He may go on to the Preakness.